Machine learning is a type of Artificial intelligence (AI) that provides computers with the ability to learn data automatically without human interventions. Machine learning is a method of data analysis that provides computers with the ability to learn without being explicitly programmed. It is a branch of artificial intelligence based on the idea that systems can learn from data, identify patterns and make decisions with minimal human intervention. Machine learning is a simply a way of achieving Artificial intelligence (AI). Machine learning was coined in 1959 by Arthur Samuel. Deep Learning also known as Deep Neural Learning or Deep Neural Network. 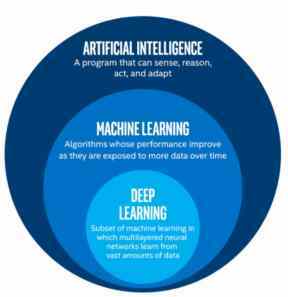 Deep learning is a subset of Machine Learning in Artificial Intelligence (AI) that has networks which are capable of learning unsupervised from data that is unstructured or unlabeled. Artificial Intelligence (AI) is computer Science that makes machine same like they have human intelligence. Professor John McCarthy is the father of Artificial Intelligence (AI).